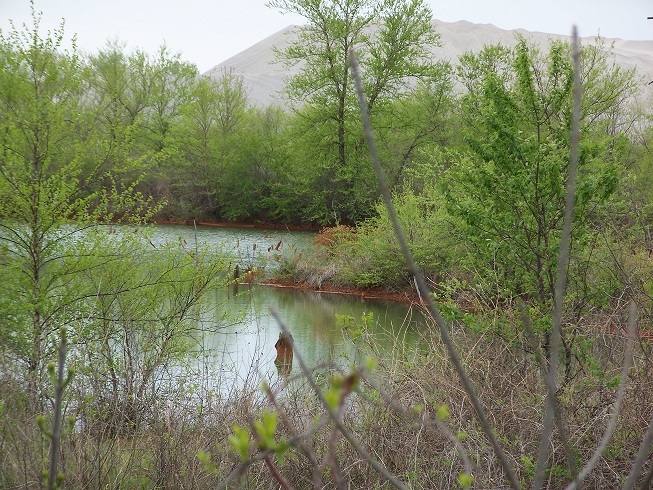 Image of chat pile behind mine collapse basin and forming wetlands near 40 Rd in Douthat area. Image by author, 2007. Land cover in northern Ottawa County, northeastern Oklahoma has been ever-changing since the early 1900s due first to the effects of mining and more recently due to remediation efforts which are ongoing. This area, known as the Tar Creek Superfund Site, includes the old Picher Field lead and zinc mining area of northeastern Ottawa County. The site was placed on the EPA National Priorities List in 1983 and covers an area of approximately 40 square miles (~100 km2 ). As a result of mining from the early 1900s to about 1970, the surface water, ground water, sediments and floodplain soils are contaminated by heavy metals. There are numerous large tailings piles, remnants of old mills and areas of subsidence and collapse. The goal of this project was to identify variabilities and changes in land cover through processing of Landsat satellite imagery with Idrisi Taiga’s geographic information system (GIS) software. NAIP high altitude aerial photography was also used for reference and comparison of a Picher neighborhood.. As expected, the combination of GIS techniques utilized in the project proved to be more successful in pinpointing variabilities and changes than simple visual study of Landsat imagery. Problems with this webpage? Please click here to notify author. Thank you.